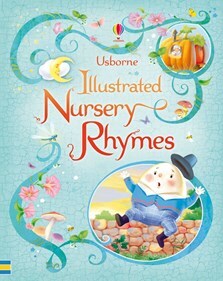 A beautiful gift edition of over 100 traditional nursery rhymes, stylishly presented with a padded cover. With enchanting illustrations alongside well-known tongue-twisters, sayings and lullabies. A wonderful gift that is sure to be treasured. My daughter (3 1/2), husband and I all love to read the stories in this book. The book is beautifully bound giving it a very special rather magical appearance for a child. For nearly a year we have read these stories over and over and over and no-one in the family has tired of them. The illustrations and the text make the stories fun for everyone. Once my child has outgrown this book I plan on tucking it away with the hope of one day reading it to her children. Even though I'm 21, I purchased this book to see if I could remember any of the stories from my childhood. I have heard of most of the stories and I like the illustrations, especially the ones by Stephen Cartwright because they are instantly recognisable. This is a wonderful story book for any girl aged 5 and over or for young ladies who are big girls at heart. I have two girls 4 & 8 and we read a story from this book nearly every other night. Beautiful illustrations and enjoyable stories. A definite keepsake book to be handed from generation to generation.